Dress research is one of the great pleasures of the historical costuming hobby, and it's also a necessity. We all start off along this interest in old clothes knowing nothing, then slowly and diligently compiling and refining and adjusting our knowledge over time. In my nigh 15 years of historical costuming, the overarching lesson I have learned concerning dress research and knowledge is that it is constantly shifting. The more I learn and study and look and dig and discuss, the more my pre-conceived ideas are turned upside down. New information is coming to light every day; it is the obligation of historical dress students to update and include the new knowledge in their projects, papers, and presentations. This does not mean that we know everything all at once, or need to, only that whatever new tidbit you pick up should add to or adjust your trough of truths moving forward. Recently in researching for The Book and working with Abby Cox, I've had a couple big shifts in my dress knowledge that got me thinking about confirmation bias. These shifts scared me not because it was new information come to light but because it was information that had always been there, right in front of my eyes, that I simply failed to see. Look closely at every small detail of this portrait. What do you see? Make notes of it. Did you notice the small frill of lace around the neckline (the tucker)? This small detail is so important yet is the most commonly missed part of historical costume recreations. What a silly idea, that we just simply don't see what's right before us, and yet it happens all the time! When researching, we tend to look for something specific that will confirm an idea we already have. I find myself so focused on looking at one part of a painting, print, or extant gown that I totally miss other aspects of it. For instance, the first project we made for The Book was an under-petticoat. This simple, short petticoat serves multiple purposes and is worn under the stays and under the skirt supports too. I originally questioned this - wait, I thought petticoats were worn over the stays...? 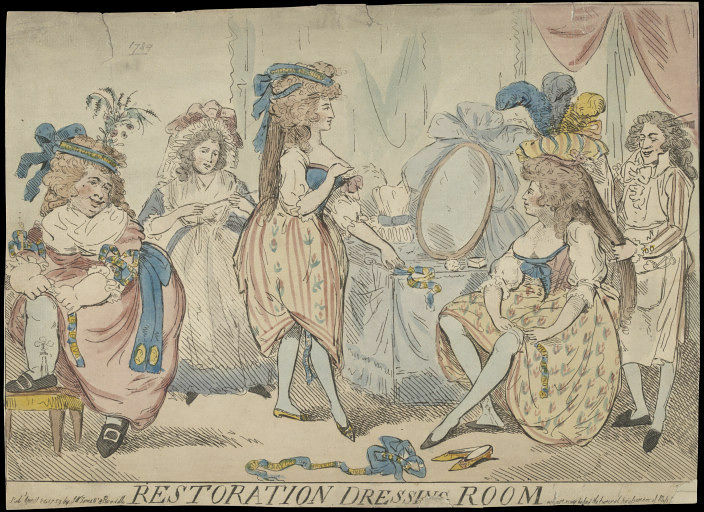 As it turns out, in myriad primary sources showing women dressing, there it was, the under-petticoat under the stay tabs and beneath the hoops or bum pads. Now this may seem obvious to you, but it wasn't to me. Why did I not know this? It was not for lack of looking at images but lack of seeing this detail. It was because my concept of how to get dressed was formed early on in my costuming career and then hardened. Ouch. I bump into these things all the time now. What are we really seeing when we look at original references? 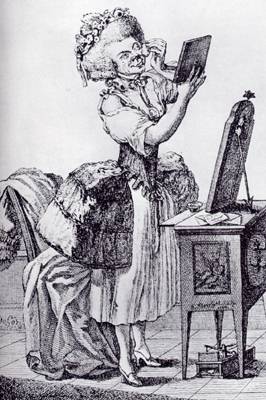 Are we thinking about historic construction, design, materials, and dressing through a modern lens or that of a mantua maker, milliner, seamstress, or couturier of that unique time? At first glance this just looks like a short sacque but with a closer look the cut away front breaks some "rules." It's a polonaise sacque - yup, front of a Polonaise, back of a sacque. The problem is not this garment; the problem is our modern "rules." It's a fascinating brain melt to grill up for breakfast! I encourage everyone (myself included) to crack open the very first historical costuming book you bought and really look at the images again. Notice every small detail and think about the "why" behind its depiction. You'll be amazed at what you missed and also what you now understand better with the experience you've gained in making your own costumes. One thing that happens to me all the time that you don't mention is when you find that you have simply forgotten key information that exists IN A SOURCE YOU READ a long time ago. Sigh. It's hard trying to keep one's preconceptions out of one's research when memory is both finite and malleable. This is wonderful, and fascinating. Thank you! When I see the Polonaise/sacque jacket, I imagine a lady who liked to experiment and see what the end results would look like. It actually does look pretty cool! Now that you've seen this polonaise-sacque, you'll start to see them everywhere. There are several example floating around. One is in the KCI (a full length sacque), and one popped up on Facebook just a couple days ago too. Oh, awesome! I have that big giant book that the KCI published about fashions from the 18th to the 20th century and I wonder if it's in the book. There's is a cutaway-front Sacque in the KCI book. It's pink with painted silk trim and gauze. Dates c. 1780. Oh man. So true. The more I research, the more I realize I know so little. But I think so much of the fun is learning and improving with every project, versus just "making pretty things." It is such a journey! Now I have to go back to some of my favorite resources and go back over the details. I'm sure I'll see some new things I will want to learn more about! Awesome! I would love to be able to sit in on that class to see what the students come up with. Hi! Every word is true! When we want to remake a dress, we only see the color, the fabric, the decorations and overall silhouette. At the end we forget about the neck ruff, cuffs, jewelry, etc. And when looking into the mirror we only wonder "Why don't I look like it?" Because there were neck ruff, cuffs, jewelry, etc. This is the ultimate mistake almost every costumer makes! The devil is in the details. On the other hand, I'm surprised you didn't know about under petticoats, these are basic, can be worn under or over the corset, but always downmost (cages, proper petticoats come above this), but during the late victorian period could be replaced by a long chemise hem adorned like an under petticoat. Back then everything was in relation and everything had a reason to be there! Yup, I didn't know about the underpetticoat. I just always assumed it was the shift I was seeing (and in some cases it is), so that's what I expected to see and then did see. I didn't "re-see" that it was a separate petticoat in many prints/portraits until someone else pointed it out to me. That's why I used my own embarrassing experience to demonstrate how our ideas and assumptions can harden and it's essential to revisit research, even of the most basic things we think we understand, throughout our own costuming journeys. I've seen both a long, full shift and a separate under petticoat. Both make sense, but having that extra layer of padding between the underpinnings (hoops, bum, etc) makes a lot of sense to me and is more comfortable to me too. There is actually a major work of 18th century fiction that deals a lot with underwear and the order with which they were... well divested. I am sure Cleland didn't write Fanny Hill for costume nerds but I don't understand why academic and non-academic costume research isn't all over it. It gives a pretty good idea what was considered essential dress even in intimate situations. In Fanny's major striptease scene, her cap goes last. And that accidentally. It's also one of the few items she wears after a very intense night. So where else can you possibly get an answer to "did the cap stay on?" I don't recommend reading lightly because it's what it is. But it's literally a primary source on underwear that is two clicks away. And not some obscure illustration hidden five pages into an equally obscure keyword on pinterest. Absolutely. It's humbling. My jaw hit the deck when Luca Costigliolo pointed out that the binding on a Victorian corset is cut on the straight grain... because it's a stay tape holding the shape of the edge. Mind blown! Your post reminded me of my Professor, who when asking about a costume question, would playfully nudge me in the head with the remark "it's obvious to you." The original source is always, always important. But we also must remember that there are multiple variations, and that fashion/clothing was not writ in stone; the same applies to figures that are mounted in museums - the additude towards dressing has changed over the years, as have the interpretations. Which they are - just interpretations. And there are many, many mistakes. (I knew of one major institution that used to tuck in 20th c. dresses in the back - like a department store - to make the mannequin look skinnier). Plus, mistakes in the literature keep getting quoted over and over again ... so one does have to think. 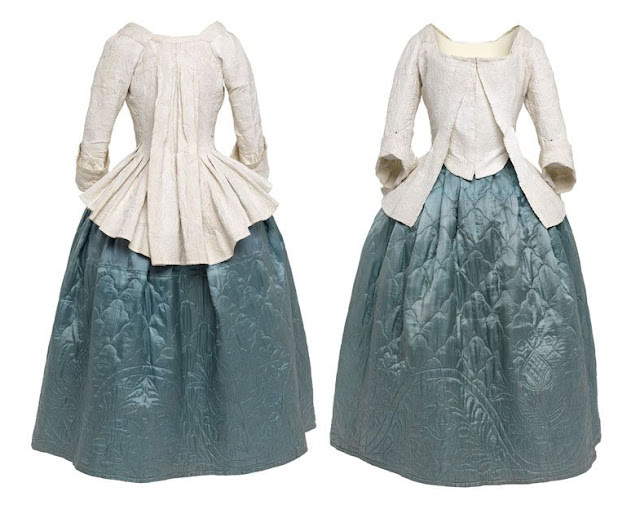 But the serious field of costume history - as an academic study - is growing and evolving. There is some really good work out there, and some that I say to myself "someone published that? it's so obvious." And remember Professor E. playfully hitting me on the head. I think this also points out the importance of looking at paintings/drawings, and not just extant garments. I think I generally feel that a garment will be more "accurate", because you know a painter hasn't idealized anything. On the other hand, it will be missing all the accessories or add-ons that would likely be lost over the years, like that tucker you pointed out. I was wondering if you have any tips on making your 18th century garments fit better, I am getting frustrated because my garment doesn't fit, I have tried to make it fit two times but it still doesn't! Do you have any tips? 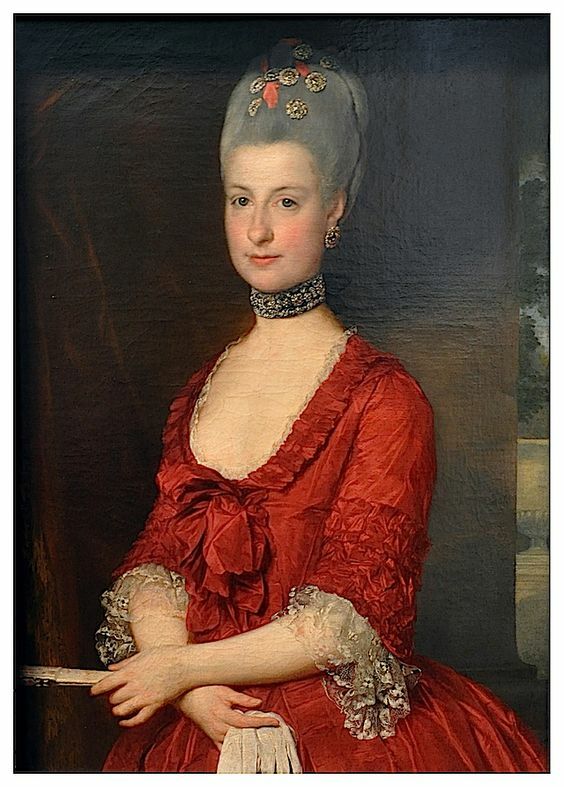 I have probably just missed it, but could you provide the documentation for the portrait of the Fabulous Red Dress Lady? That's exactly what happened with me--my first-ever CW book of fashion, that I've had for 20 years, and read dozens of times. It only uses the word "fourreau" once, and yes, it's an Anglaise-pleated style back, so I didn't think much about it when others used the words interchangeably. Then I looked at it (after devouring your book! :) and realized it says "en Fourreau a la Anglaise" --the Fourreau is referring to something, but the back is identified separately. I poured over the sketches and diagrams, and finally realized , this is not called a Robe, when the other "gowns" are all named as such. And the big difference between them is, the Robes are all open-front over a petticoat, while this "Fourreau" has its own skirt-front, with a comperes-front bodice. So, Fourreau is the all-in-one frock, the "babydoll" of its era. And it took me 20 years to see it.